Hand made 18ct white gold 3 stone diamond ring set with a 0.71ct Fancy Pink centre diamond and matching Evs heart shape diamonds. This design has been hand made in our Brisbane Studio. 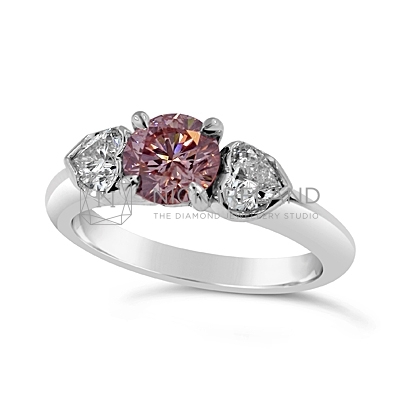 We have excellent stock of individual and matching sets of Argyle Pink Diamonds in many different colour tones and can custom make this design to accommodate most budgets. Make an enquiry and Nick will be in touch to discuss your ideas.